hitchBOT | A robot exploring the world. AndreaWBZ: EXCLUSIVE PHOTO: evidence of vandalized hitchhiking robot in #philly. #hitchBOTinUSA trip is over…. hitchBOT’s trip came to an end last night in Philadelphia after having spent a little over two weeks hitchhiking and visiting sites in Boston, Salem, Gloucester, Marblehead, and New York City. Unfortunately, hitchBOT was vandalized overnight in Philadelphia; sometimes bad things happen to good robots. We know that many of hitchBOT’s fans will be disappointed, but we want them to be assured that this great experiment is not over. I can’t wait to see what they come up with next!! I love robots, so the idea of a hotel staffed by robots sounds like ten kinds of awesome. And then I remember what kind of robots we’re talking about. These are like Disneyland Robots who give automated speeches. They don’t look at me, recognize the RFID tag on my hotel key and say, “Hello, Laura! How are you today?” They tell me where to go if I want to find the swimming pool. The Luxor hotel had this back in 1993. These camels bragged about the hotel and all the fun things to do there. I’m sure the dinosaur and woman in the pill box hat do the same thing. At least Henn-na has robots deliver food to you. Of course, they keep getting stopped for photo ops, so I think I’d just prefer to get my food myself. In the end, I think robots are cool and every step toward their development is a step in the right direction. I just wish I was to that House of the Future time when the robots were actually helpful and interactive. I really like this window cleaning robot from Winbot. What the boating industry needs is a robot like this to clean the bottoms of boats now that it’s not longer legal to paint them with copper paint. But for now, I think every person who has difficult to wash windows will be happy to have one of these robots. I was hugely disappointed because the way they had her set up, she was NOT an android. If you listen to my video, you can hear me try to talk to her like she is my buddy. It wasn’t until I saw on the screen that it said, “She is not interactive. She does not respond to the audience’s motion or voice.” She was just like the animatronic pirates on the Pirates of the Caribbean ride at Disneyland, repeating a presentation over and over. When she tries to smile at the beginning of the video, it just looks wrong, somehow. When she starts doing the sign language, she looks awkward. Disneyland’s Abraham Lincoln looked just as creepy almost fifty years ago. I am beginning to doubt that I will ever get my robot friend before I die. I’m alright with Roomba vacuuming my home. I don’t own one, but I wouldn’t fear it if I did. 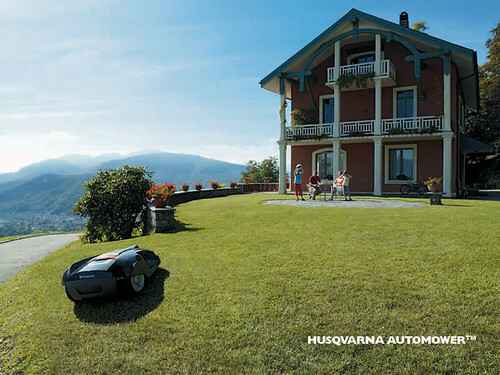 The Husqvarna Automower, however, isn’t something I’m comfortable handing over to a robot. I don’t want to explain why my lawn mower killed my neighbor’s cat. It’s just a conversation I’m not willing to have. All joking aside, I AM tempted by it. The idea of being able to just set the lawnmower out on the lawn and letting it take care of the grass is very appealing. If the Roomba is any indication of how easy the Automower is going to be, however, I don’t think it will be very useful unless you arrange your yard so that it will never get stuck between the doghouse and the bushes. Unfortunately, the Automower isn’t quite ready for a set it and forget it person yet. 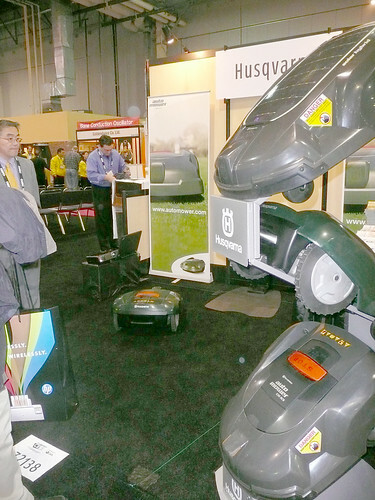 After watching the demonstration, it was obvious that the Husqvarna Automower uses the same driving algorithm as the Roomba. This is fine for vacuuming up the floor, but for cutting the lawn, it’s just not an option. The lawn cutting would show the nearly random path that your Automower took. When I was a child learning how to mow the lawn, my grandfather was VERY particular about how it should look. One week, we would cut the lawn horizontally. The next week, we cut the lawn vertically and the third week we cut the lawn diagonally. After that, we would go back to the beginning. Part of the reason we did that was to prevent grooves in the ground where the lawn mower wheels ran, but there was another thought at play in my grandpa’s mind. Cutting the lawn in these patterns was aesthetically pleasing. You could tell how we cut it for a day or so and it looked pretty. I especially liked the diagonal weeks and wondered why he would never let me do circles. The pattern of cutting on the lawn left by the Automower, however, would be anything but aesthetically pleasing. Honestly, lawn mowing is ALL about making the home beautiful. If the Automower can’t do that, then you might as well use ForeverLawn and be done with it. Watching this video sparks an innate fear of technology that comes from watching too many 1950’s sci-fi movies and 1980’s action flicks. This could be the scene of science gone terribly wrong or a horribly gory fight sequence.